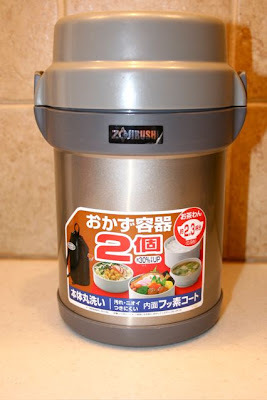 Lately I have been using my Zojirushi bento lunch jar to take my lunch in to work. 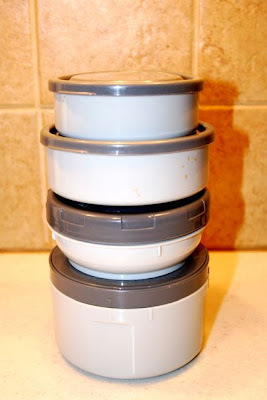 These are great to portion out food for healthy eating. Of course you don’t need to put in just Japanese food! Here is one of my recent lunches. This consists of mostly vegetables. On the left is some left overs that I slow cooked over the weekend. It has ham, soybeans and barley. 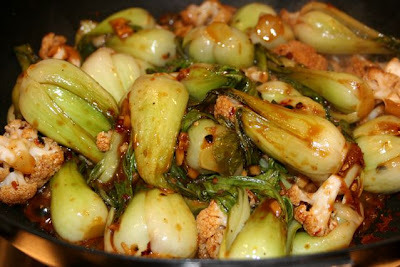 Front and center is baby bok choy that has been steamed until tender. It was seasoned with ginger, soy, sesame oil and a bit of rice vinegar. 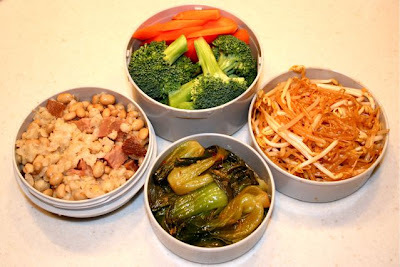 On the right is a Korean style bean sprout salad made with steamed and cooled sprouts, garlic, sesame oil and a bit of gojuchang paste. I added some extra raw bean sprouts for the crunch. The largest container on the top contains just raw broccoli and carrots. Healthy – Low Fat – and Delicious. That and an orange makes for a pretty filling and fulfilling lunch. If you love pocket bread as much as I do you will probably try to make it at some point. It’s really not hard and it’s magical to watch. 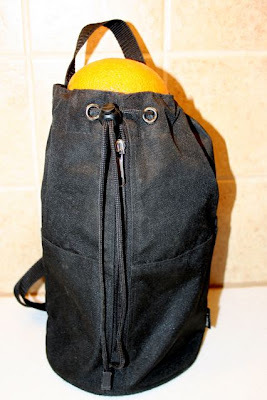 The dough puffs up in the oven when it bakes to create the pocket inside. 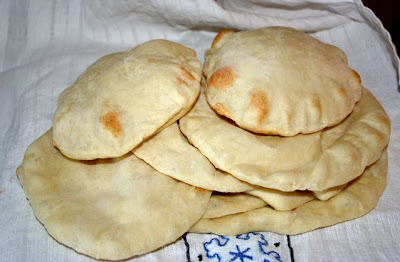 This pita is made with a dough from the wonderful Bread Bible by Rose Levy Beranbaum. 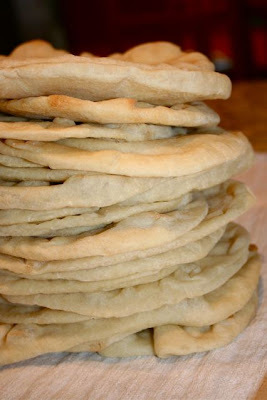 The recipe makes a wonderfully soft dough that works perfectly for pita or pizza. Here is her recipe. The dough should be kneaded very well. We used a kitchen aid with the dough hook and kneaded it for 10 minutes. Key to getting wonderful flavor is to let the dough rise long and slow in the fridge. 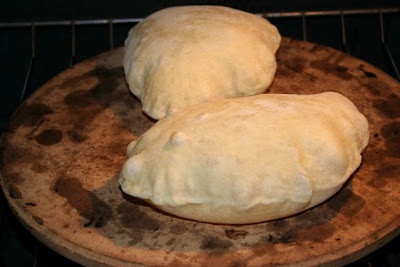 Once kneaded the dough is covered to keep the air out and placed in the fridge. Let it rise slowly. After one night we let the dough rise on the counter then put it back in the fridge for another day. You can keep the dough for up to 3 days chilled. If you have the time the long slow fermentation creates a wonderful flavor. 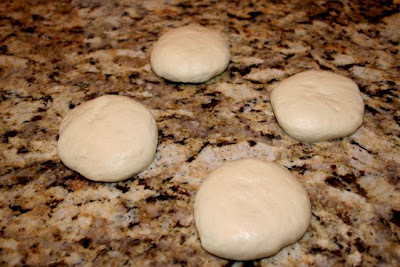 After the dough has risen as long as you like, divide the dough into 12 equal balls and flatten them slightly. Cover them with plastic wrap and let them rest for 20 minutes. The dough will relax and make it easy to roll out. 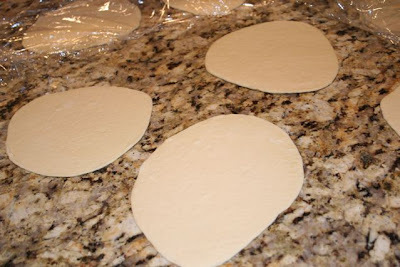 Roll out your dough into rounds about 1/4 inch thick. 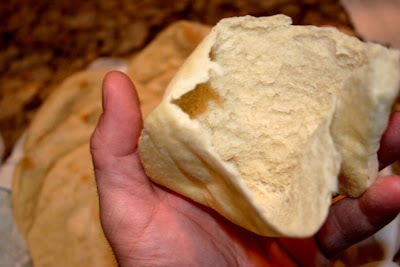 If you like a thicker, more bready pita roll them thicker. 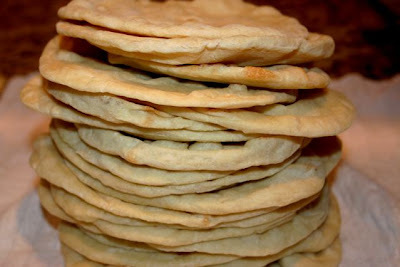 I found using my pasta roller machine makes the pita with a consistent thickness. I rolled them up to setting 4 on my machine. Once rolled out let the dough rest for another 10 minutes before baking. 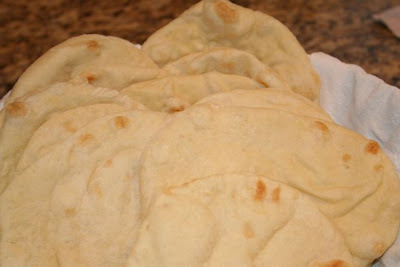 You must have a pizza stone or a cast iron skillet to make the pita. You can do it on top of the stove but I have found best results using a stone in a 475 °F oven. Preheat your stone for about an hour before baking. Slap the dough onto the stone being careful not to let it fold or have air pockets underneath. To get a consistent puff you want the entire bottom of the dough round to be in contact with the hot stone. See how the pop up after a minute or so? The steam insides puffs them. Bake for about 3 minutes or until you just start to see them begin to brown. I bake two at a time and place them on top of each other under a towel as they come out of the oven. After they have cooled for a couple of minutes I gently press them down to flatten them. They probably would flatten by themselves though. Be careful not to burn yourself from the steam inside. See how nice they turned out? Talk about a clash of cultures. 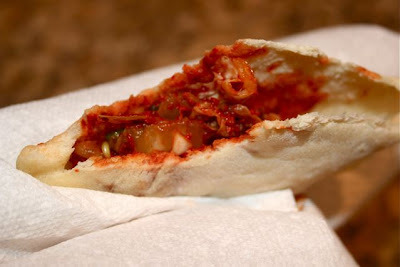 How about a middle eastern pita with kimchee inside? It’s not much to look at but it was tasty and healthy. I’m talking about my chicken dinner. Looks (and taste) can be deceiving. I have here a grilled chicken breast which has been split and stuffed with garlic slices and kalamata olives. Fresh steamed broccoli provides the vegetable component. But what is that the chicken is resting on? A pile of mashed potatoes? Well, it looks like potatoes and tastes pretty much like potatoes but it is all cauliflower! 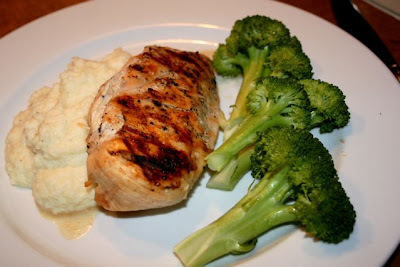 A great tasting, low carb alternative to mashed potatoes. 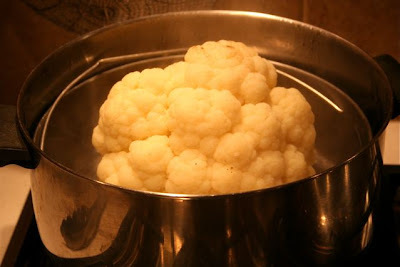 I started with a head of cauliflower which I steamed until it was very tender. This was puréed in my food processor along with a splash of milk, a dollop of healthy olive oil, salt and pepper and just a tsp of butter for flavor. To make the chicken I cut a pocket in the side of these hefty sized boneless, skinless chicken breasts and stuffed them with lots of sliced garlic and chopped kalamata olives. 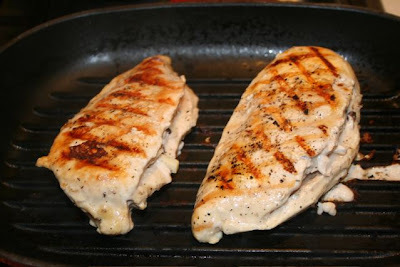 They were grilled in my Le Creuset grill pan until just cooked through and still moist. I didn’t make a sauce for this but that would have been great on top. 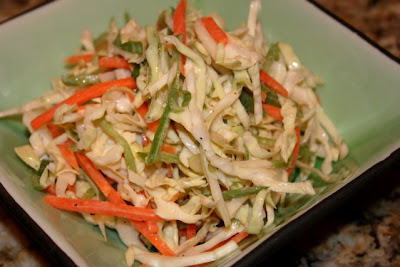 I also served it with a light and healthy slaw. This has cabbage, carrots and green peppers. The dressing is made with just a scant amount of mayo and rice vinegar. On New Year’s Day I wanted to use black-eyed peas. There is a tradition in the South that black-eyed peas should be eaten on New Year’s Day for good luck. Instead of the typical peas cooked in a soup or with ham or something, I decided to make a mixed grain and legume base for a vegetarian stir fry. 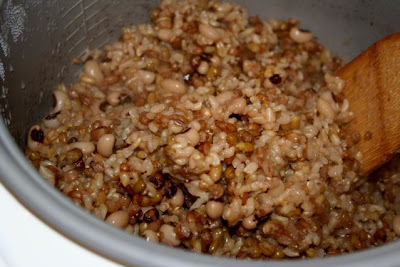 I first just tossed together some Thai brown rice, kamut, spelt, wheat berries, mung beans and black-eyed peas in a bowl and soaked them in water for a couple of hours. I then put everything into my rice cooker and put it on the brown rice setting. An hour and a half later I had this wonderfully healthy grain/legume mixture. 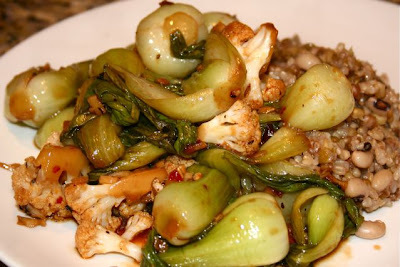 For the stir fry I used baby bok choi and cauliflower. I first steamed them for a few minutes just to start getting them tender and make the stir fry easier. I fried these up with garlic, ginger and red chilis in oil. Near the end it was seasoned with soy, sesame oil and thickened with just a bit of corn starch. It was oh so tasty.